The English poet, painter, and printmaker William Blake has contributed a wealth of visuals illutrating religious and other literary texts. 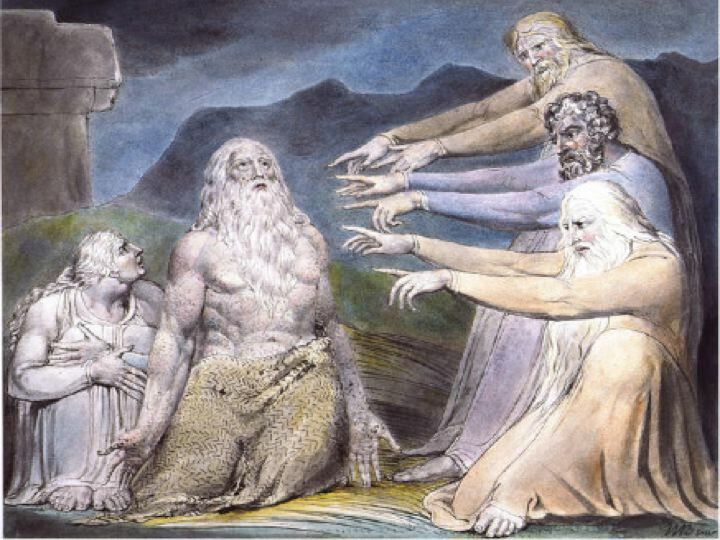 His most famous Bible related work would be illustrations of The book of Job. Actually, if you read the Wikipedia entry for "William Blake," you will find that "despite his work in illustrating the Book of Job, Blake's affection for the Bible was belied by his hostility for the church, his beliefs modified by a fascination with Mysticism and the unfolding of the Romantic movement around him." Hmmm....a person's commitment to religious art is not automatically linked to any commitment to a religion or relationship with the Almighty. Anyway, the William Blake archive is a hypermedia archive sponsored by the Library of Congress and supported by the Preservation and Access Division of the National Endowment for the Humanities, the Institute for Advanced Technology in the Humanities at the University of Virginia, the University of North Carolina at Chapel Hill, Sun Microsystems and Inso Corporation. If you visit this site, you will be able to find Blake's illustrations. You can access the site at the URLs listed below.